1. 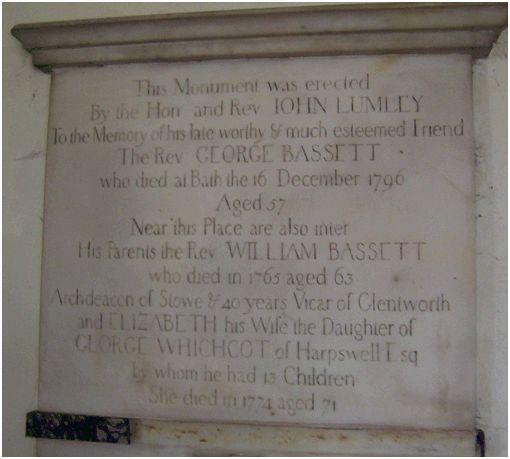 Richard BASSETT of Glentworth, son of the Venerable William BASSETT Archdeacon of Stow, Lincoln (1703-1765) and Elizabeth WHICHCOT (1705-c. 1774), was born on 15 September 1744 in Glentworth. He was a Gentleman, Soldier. He married Martha ARMITAGE on 1 July 1774. He died on 12 July 1805 in Glentworth. He was buried on 17 July 1805 in Glentworth. He married Mary UNK. ... of Glentworth, Lincs. His will is available at the National Archives, and Philip Wilson has a copy which he will be transcribing for these records. According to Lincolnshire Pedigrees, Richard was in the army. Martha BASSETT (1776-1869). Martha was born in 1776 in Glentworth. She was baptised on 27 September 1776. She married John WILSON on 17 October 1798. She died on 18 February 1869. Henry BASSETT (1778-1852). Henry was born in 1778. He was baptised on 12 April 1778. He died on 1 May 1852. Harriet BASSETT (1781-1785). Harriet was born on 24 April 1781 in Glentworth. She was baptised on 24 April 1781 in Glentworth. She died in 1785 in Glentworth. She was buried on 27 May 1785 in Glentworth. Louisa BASSETT (1787-1796). Louisa was born in 1787 in Glentworth. She was baptised on 7 July 1787 in Glentworth. She died in 1796 in Glentworth. She was buried on 24 November 1796 in Glentworth. Richard BASSETT ( -1792). Richard died in 1792 in Glentworth. 2. the Venerable William BASSETT Archdeacon of Stow, Lincoln, son of Revd. William BASSETT and Lydia ADDERLY, was born on 7 June 1703. He was a Clergyman. He married Elizabeth WHICHCOT on [Julian] 19 February 1729 in Glentworth, Lincs.. He died in 1765. He was buried on 13 July 1765 in Glentworth. 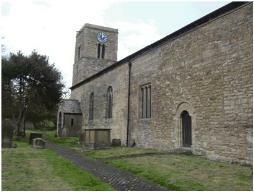 William was vicar of Glentworth in 1725; curate of Toft-by-Newton in 1727 and subsequently became Archdeacon of Stow. Frances BASSETT (1731- ). Frances was born on 22 February 1731. Katherine BASSETT (1732- ). Katherine was born on 14 January 1732. Elizabeth BASSETT (1734-1736). Elizabeth was born on 14 April 1734 in Glentworth. She was baptised on 16 May 1734. She died on 30 May 1736 in Glentworth. Harriet BASSETT (1735-1736). Harriet was born on 4 November 1735. She died on 19 May 1736. William BASSETT (c. 1737-1738). William was born circa 1737. He died on 18 November 1738. Ann BASSETT (1739- ). Ann was born in 1739. She was baptised on 24 May 1739. George BASSETT (1740- ). George was born on 27 September 1740. He was a Clergyman. Lydia BASSETT (1742- ). Lydia was born on 17 February 1742. She married William MARTINDALE on 8 September 1775 in Glentworth. Charlotte BASSETT (1743- ). Charlotte was born on 20 September 1743. She married Benjamin CODD on 17 April 1766. Thomas BASSETT (1746- ). Thomas was born on [Julian] 22 January 1746 in Glentworth. He was baptised on 23 July 1746 in Glentworth. John BASSETT (1747-1805). John was born on [Julian] 22 February 1747. He was a Clergyman. He died in 1805. He was buried on 10 January 1805. Charles BASSETT (1749- ). Charles was born on 21 July 1749 in Glentworth. He was baptised on 21 July 1749 in Glentworth. 4. Revd. William BASSETT, son of Revd. William BASSETT, was born circa 1663. He was a Clergyman. He married Lydia ADDERLY on 28 October 1697 in St. Mary's, All Saints, Chesterfield, Derbyshire. He died in 1729. He was buried on 10 May 1729 in Glentworth. This is the first mention found of a Bassett in the parish records for Glentworth. William became vicar of Glentworth in 1696, and curate of Harpswell. His birth is calculated from Lincolnshire Pedigrees, which state that he died at the age of 66.
s. William, of North Kilworth, co. Leicester, cler. Magdalen Hall, matric. 4 May, 1693, aged 17; B.A. from Pembroke Coll. 1697, M.A. 1700, one of these names vicar of Glentworth, co. Lincoln, 1696-1729, and of Toft, co. Lincoln, 1719-29, his father rector of North Kilworth 1666. See Foster's Index Ecclesiasticus. Elizabeth BASSETT (1698- ). Elizabeth was born on 20 September 1698. Ralph BASSETT (1700- ). Ralph was born in 1700. Lydia BASSETT (1705- ). Lydia was born in 1705. She married Robert CAPPS on [Julian] 19 February 1729. She married Robert ATHORPE on 27 September 1739 in Glentworth. She married John STOW on 20 June 1747 in Glentworth. John BASSETT (1708- ). John was born in 1708. He was baptised on 30 September 1708. Ann BASSETT (1710-1710). Ann was born on 7 September 1710 in Glentworth. She was baptised on 7 September 1710 in Glentworth. She died on 7 September 1710 in Glentworth. She was buried on 8 September 1710 in Glentworth. Charles BASSETT (1712-1763). Charles was born in 1712. He was baptised on 24 July 1712 in Glentworth. He died in 1763. He was buried on 13 July 1763. Katherine BASSETT (1715- ). Katherine was born in 1715 in Glentworth. He was baptised on 14 July 1715 in Glentworth. 6. Colonel George WHICHCOT MP, of Harpswell, son of Sir William WHICHCOT of Fotherby and Lady Margaret CLIFTON, was born in 1653. He was christened on 6 June 1653. He was baptised on 8 June 1653 in Fotherby, Lincs.. He married Frances MERES on 11 November 1699 in London. He died circa 5 September 1720. He was buried on 9 September 1720 in Harpswell, Lincs.. He married Frances BOYNTON. He married Isabella ROBINSON. WHICHCOT, George (1653-1720), of Harpswell, Lincs. Capt. Ld. Castleton's (George Saunderson*) regt. ft. by 1690 -at least 1692. Whichcot gained entrance to Westminster in 1698, when standing alongside the Tory Charles Dymoke*, and shortly afterwards was listed as a Country Member. He made no significant contribution to Commons business in that Parliament, and on 24 Jan. 1700 was granted leave of absence. His political sympathies at this time are unclear, since the only surviving assessment of his position, an analysis of the House in early 1700, cited him as 'doubtful'. In September of that year he appeared ready to resign his electoral interest to John Hervey*, who in turn encouraged him to put up, commending his performance at Westminster. Despite such support he did not stand in January 1701, but made interest for the county later in the year, writing to the Duke of Newcastle (John Holles+) in acknowledgement of the Duke's 'interest with Mr Guile, who declares he will bring me in 300 or 400 votes'. In a circular letter he confessed that he had 'no other qualification for so great an honour but a hearty loyalty to my King and a sincere love for my country', but such patriotism did not succeed in making him a serious contender, and he withdrew from the contest, possibly for financial reasons, having complained to Newcastle of a lack of funds. Whichcot did not stand for Lincolnshire in 1702, but three years later was a central figure in a bitter dispute revolving around local cleric Samuel Wesley, a fierce critic of the Dissenters. Wesley had originally intended to support him at the county election of 1705, but then changed his mind, and wrote to him to explain that even though Whichcot "is as firm to the Church of England as any . but yet when it comes to a Party cause, everybody knows how the votes run in both Houses, and that 'twould look ungrateful to disoblige a body of men who had been the chief cause of one's election ... Can any Member be false to his electors, who make him what he is, and if it comes to a division in the House for the Church or against it, which side will he embrace?" Whichcot passed this letter to his Whig allies, and reportedly published an answer to Wesley, accusing the clergyman of perfidy and ingratitude, The controversy appears to have worked to Whichcot's advantage, since he finished top of the poll. His return was classed as a gain for the Whigs by Lord Sunderland (Charles, Lord Spencer*), and he was regarded as 'Low Church' by an analyst of the new Parliament. He duly voted for the Court candidate for Speaker on 25 Oct. 1705, and supported the government on 18 Feb. 1706 during proceedings on the 'place clause' in the regency bill. In this first session, he was involved with the management of two private estate bills, and was appointed to the drafting committee of a bill to improve river communications with Boston. He was not active in the remaining sessions of this Parliament, but from May 1707 was eager for advancement, his Patron Newcastle striving to secure him the governorship of Tynemouth. His candidacy was opposed by the 'duumvirate', Lord Godolphin describing him as one of Newcastle's 'whimsical' allies, and the Duke of Marlborough (John Churchill+) insisting that a veteran of the current war should get the post. The matter was not finally resolved until February 1708, and such hopes of preferment may have influenced his Political loyalties, for in the winter of 1707-8 he was associated with the 'Lord Treasurer's Whigs', who sought to defend Godolphin against attack from disaffected Junto leaders. A parliamentary list of 1707-8 classed him as a Whig, but he did not gain the Tynemouth governorship. "I find all the parsons, who endeavour to incite the people, in greater heats here than the Oxonian parsons in London. And indeed they press their non-resistance doctrine so far that they rather excite the people against themselves than the government, which I tell all my friends they are not only angry at because they cannot have the administration of it themselves; and I do not doubt my arguments out of the pulpit will be as prevailing as theirs in it." Such hopes were dashed at the general election held later in the year, when he stood alone against two Tory candidates. His campaign was again hampered by a shortage of money, and he warned Newcastle that he would not stand unless he was assured of receiving ?00. Such assurances were presumably given, and after suffering a heavy defeat at the polls, he sought partial reimbursement of his expenses from the Duke of Newcastle and Lord Dorchester (Evelyn Pierrepont*). Financial embarrassment probably brought an end to Whichcot's electioneering, In the immediate aftermath of defeat in 1710, he had spoken optimistically of strengthening his local interest, and expressed hope that the High Church 'frenzy' would pass, but he did not stand again. The advent of Hanoverian rule failed to resurrect his parliamentary career yet proved a boon to his fortunes, for in March 1718 he was granted an annual pension of 4400. He did not enjoy this windfall for long, dying in 1720. The exact date of his demise has not been ascertained, but his will was proved on 3 Nov. 1720. In that year his heir Thomas was warned that the family estate had been much impaired by Whichcot's political campaigns, and he was urged not to follow such an example. Nevertheless, Whichcot jun. did emulate his father, representing Lincolnshire from 1740 to 1774. Frances WHICHCOT (1680-1720). Frances was born in 1680. She died on 31 March 1720. William WHICHCOT (1682-1684). William was born in 1682. He died in 1684. Sherwood WHICHCOT (1682-1682). Sherwood was born in 1682. He died in 1682. George WHICHCOT (1686- ). George was born in 1686. He was baptised on 30 March 1686 in Essendon, Hertfordshire. 7. Frances MERES, daughter of Sir Thomas MERES Knight and Anne de la FOUNTAIN, was born in 1669. She was baptised on 2 July 1669 in St. Mary Magdalin, Lincoln. She was buried on 10 April 1733 in Harpswell. She died in August 1733. First Party: Dame Elizabeth Pettus of Racketh, Norfolk, widow. Second Party: Thomas Hayley of Bedford Row, Middlesex, Esq. Third Party: Thomas Whichcot of Harpswell, Lincolnshire, Esq. Attested copy articles of agreement for the division of the estate of the late Sir John Meres between his three coheirs at law:cc (1) receives the mansion house and manor of Kirby Bellers, lands and premises there and at Asfordby and Stonesby, Leicestershire, and the advowsons of Kirby Bellers and Stonesby. (2) receives the manor of Scotton, Lincolnshire, lands and premises there and at East Ferry, Harwick, Sidworth, Finton and Holton and the advowson of Scotton, in the counties of Lincolnshire and Nottinghamshire, and lands in the City of Lincoln. (3) receives the manor of Hiptoft Hall and lands and premises in Boston, Skirbeck, Kirton, Frampton, Fosdyke, Algarkirk, Sibsey, Wynthrope and Burghe, Lincolnshire; and Nonsuch House and other messuages and lands at Nonsuch in the parish of Tunbridge, Kent. The £ 8000 mortgage on the estates passing to (2) to be redeemed from Sir John Meres's personal estate. London property and fee farm rents at Tonbridge and Speldhurst, Kent to remain undivided. Schedule showing the value of the estates taken by each party and the monies paid by (1) to (2) and (3) to equalise their portions. Recites the background to the transaction, the rental income of the various estates, etc. Thomas WHICHCOT (c. 1700-1776). Thomas was born circa 1700. He was a Politician. He died on 30 September 1776. Katherine WHICHCOT (1701-1787). Katherine was born in 1701. She was baptised on 21 October 1701. She died on 4 July 1787. John WHICHCOT (1702-1750). John was born on [Julian] 1 January 1702. He was a Clergyman. He died on 29 September 1750.